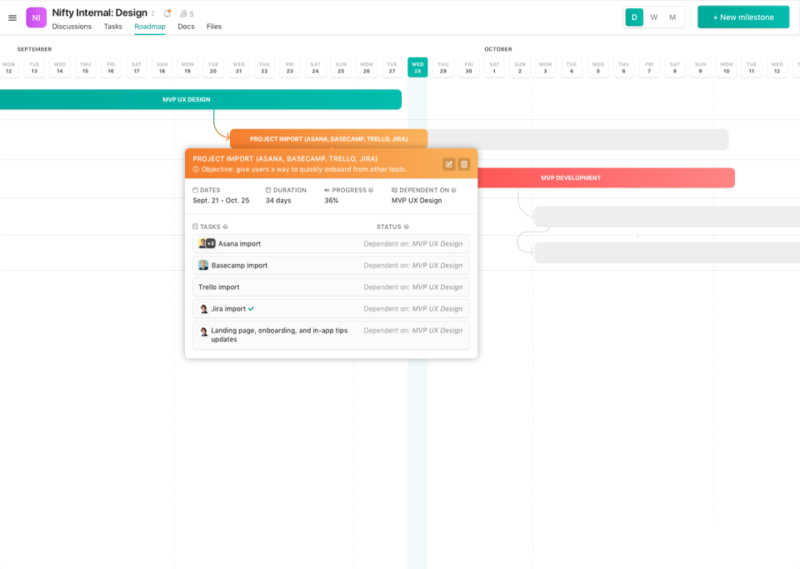 Nifty centralizes project communication, planning, and tracking in one collaborative workspace and provides a birds-eye view across all of your projects and teammate workloads. Automate your project updates and resource insights with dynamic milestone progress based on task completion. 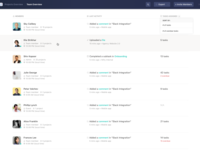 With the best of communication, task management, roadmaps, collaborative docs, and file management in one tool, you can consolidate your workday as well as your subscriptions into one browser tab! 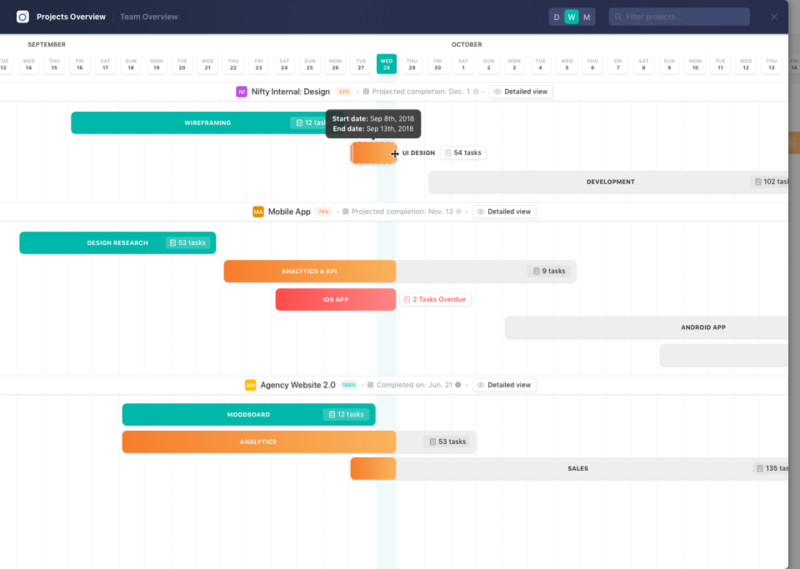 Pros: + Strikes the perfect balance between big-picture planning (roadmap is fantastic) and the daily grind (tasks, files and collaboration). Cons: No cons. A couple of very minor tweaks would be welcome, but nothing that would stop us using the platform. Plus anything we've queried is already on Nifty's short-term roadmap. 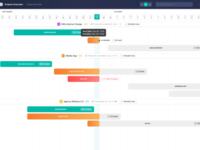 Overall: Feel like we've tried every project management platform the cloud has on offer - some have proven too complex and cumbersome (expensive bells and whistles we just don't need) or too simplistic for our requirements (we piece together 3-4 different platforms and zaps galore, so fragmented and inefficient). Pros: Automated milestone progress, amazing customer support, beautiful ux/ui. Nifty is a robust product that is super easy to use; focused on eliminating complexity. Cons: Though this not a con, we would love to have Nifty provide new feature or ability to submit documents for customer approval. Overall: Nifty has the best of most of the tools on the market in one place. Our teams productivity monitoring and task tracking experience has improved significantly. Pros: The ease of use for myself and my clients has been a huge advantage. I love that Nifty has such a small learning curve that I've never had to train my clients how to use it. Cons: No cons now that there's a way to see the overview of all project timelines. It's everything I need. Overall: My experience has been nothing but positive. 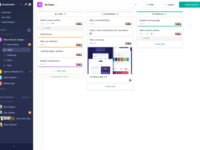 Introducing Nifty into my workflow for client management has been a game changer. Pros: All in one place! the nifty team keeps providing new updates that extends current features. Easy and simple software. They even have mobile application, so you get notifications on the go! Overall: It is smooth and easy. Best 2 attribute that most of startups like. Genuinely enjoying it, and we are looking for the next update! Pros: With the roadmap covering the overall progress of the tasks and collaborations, it's easy to keep track of a project as a whole. it works well without being too excessive on features. The interface is wonderful and elegant and ultimately for how useful it is, it's well priced. Cons: The ability to draft a task for review by customers would be greatly appreciated. Overall: Nifty has been a great tool amongst many others my boss has tried to implement to improve productivity. Pros: I compared project management for months. I have tried the really expensive ones and the free ones. Nifty compares to the high end project management tools since it has much more than what you could expect for the price range. The user interface it's what it attracts me the most since I was about to sign up with Monday before I saw Nifty. I totally recommend Nifty. Cons: The user interface is great, however, I would like the interface to occupy more screen room when it comes working on the specific folder ( project ) I choose. Minor details. Overall: Myself and the team love it. We are using it for project development, marketing and content. We love the app. Nifty fits that perfectly. It's made a world of a difference to coordination in the team, makes it super easy to build estimated project dependencies and timelines, and most importantly is easy enough to use that you keep those estimates up to date! Cons: Nifty is still early! There are some bugs and slowness, but the team has really impressed me with how fast they are to respond to feedback by shipping fixes or updates. Pros: The user experience is great and much better than other similar platforms I have tried. Cons: There are certain functionalities that still have room for improvements. Pros: The All-in-One structure of this software! It was really difficult to have an overview over every tool we used to before e.g. 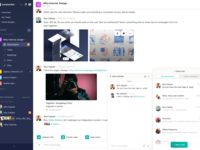 slack, trello, asana, drive etc. Another point is the milestone overview feature as gantt diagram. Cons: Sometimes the Google Documents and Sheets is not function properly. Overall: All in all everything is structured and in place. Thus there is no distraction like switching from tool to tool like we used to before. 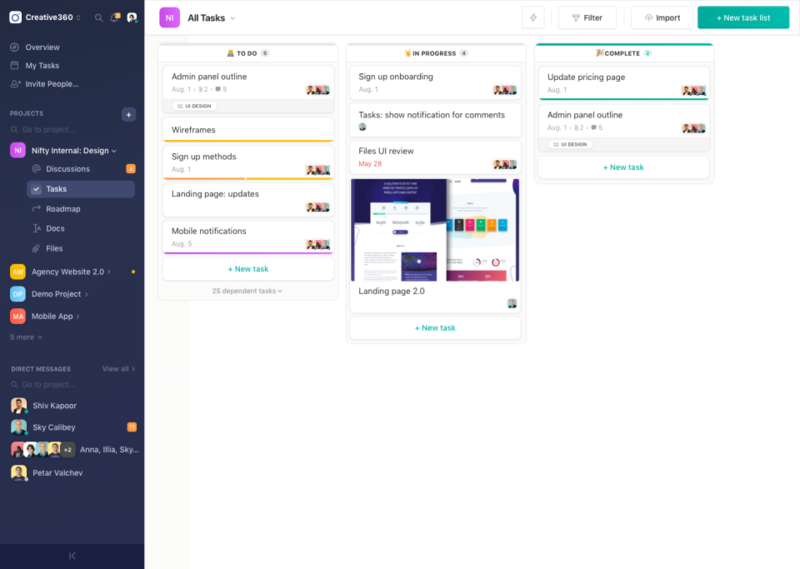 Pros: Very intuitive UI, Nifty team seems to have a lot of experience using project management tools; the app is full of features, a real "all in one" for project management... the response to actions is quick, works as expected and beyond. Pros: Easy to use, pleasant user experience. It can be used immediately. Pros: Gif functionality, how everything functions on the same interface and the general UX. Cons: Loadtimes and docs functionality can be improved. Overall: So far my experience has been great, I've already recommended it to 3 people. Would be cool if there was a affiliate program. Highly responsive support team and constantly improving the product. The UX is better than anything I've used so far. Loving the direction the team is going and feel grateful to be with them early in their journey. I think it's only going to get better. 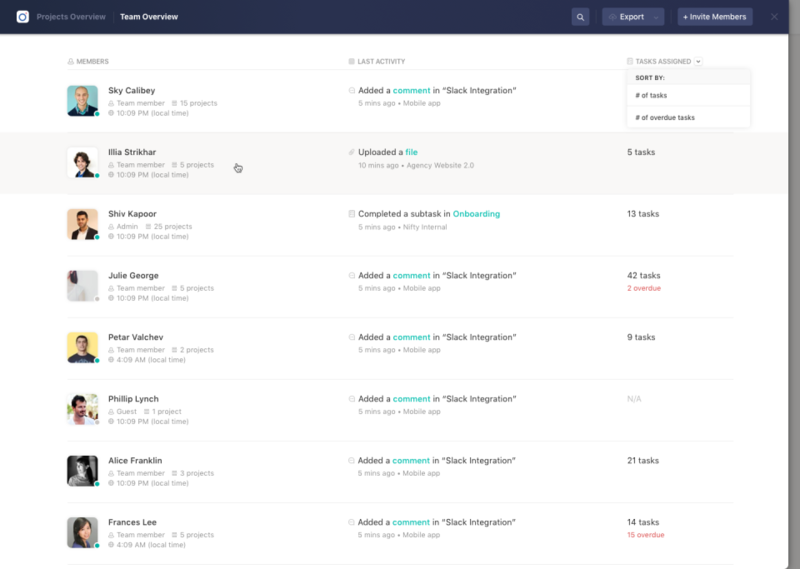 Pros: Super easy to set up, and a huge help with project deadlines and team communication. 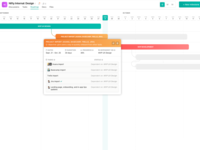 The roadmap feature is the perfect way to reflect on your work as well. Cons: There are no huge cons, but it would be great if there was a better way to use the app on mobile. Overall: Nifty takes care of every aspect of project management. I definitely recommend this software to any business. Pros: Great product, loved the UI, super simple to use post links and collaborate with team in one place. Cons: Was initially complicated to get used to. Pros: It is very user friendly and easier than other tools I've used for my job. Cons: None! It was perfect! I don't think anything needs to be changed, besides adding extra notifications when documents are posted.